There’s no denying that we Aussies love our lamb—roast, grilled, pulled, BBQ or burger, it’s got to be lamb. And we all have our favourite way of cooking it and our ‘best’ recipes, so there is no way we’re about to tell you how you should cook your lamb. 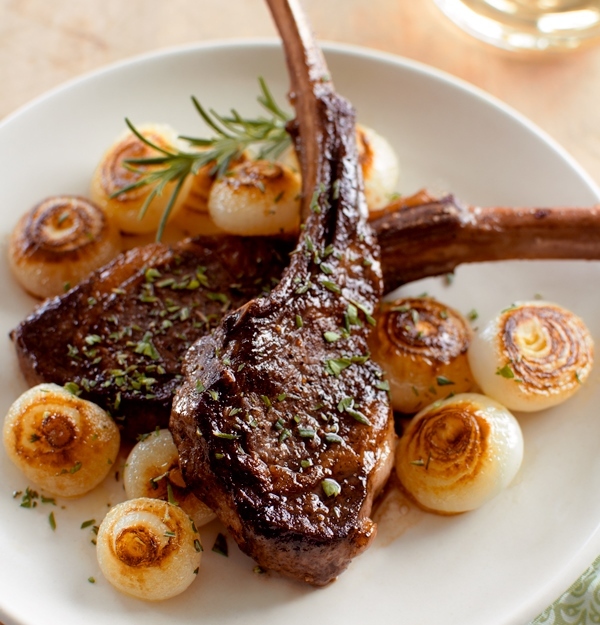 Instead, we took a roast rack of lamb and sourced some fancy ideas of presenting it. Take a look at the pics below—it’s all in the presentation! We’ve also included some recipes for veggies and sides with a difference—all you need is your favourite way of roasting your rack of lamb. Enjoy. All recipes are for four people. Image from Fork, Knife, Swoon. Strictly speaking, these onions are actually roasted, but hey, they come out tender, sweet, and moist and are super easy! We’ve used small whole onions, but you can also use large onions cut in half or quartered, depending on the size. What you need: 8 – 12 small onions (3 – 4 per person); 3 tablespoons extra-virgin olive oil; 1 tablespoon butter; 1 tablespoon finely chopped fresh thyme, and salt and black pepper to taste. What you do: Pre-heat oven to 2000 celsius. In a large bowl toss the peeled onions in the oil, thyme and salt and pepper. Spray (or brush) a baking tray with oil and spread the onions in a single layer and dot with the butter. Roast for approximately 30 minutes, stir around the tray, and continue roasting for another 20 – 30 minutes until the onions are tender and golden. What you need: 350gm frozen peas; 4 tablespoons light cream; 1 tablespoon butter, and salt and pepper to taste. Two – three Dutch carrots per person, baby spinach leaves, and two tablespoons truffle glaze. What you do: Preheat oven to 2000 celsius. Wash and brush the Dutch carrots and place on lightly oiled baking tray. Drizzle with extra oil and bake for approximately 30 minutes until the carrots are tender. Bring a pot of lightly salted water to the boil, add the peas and cook for 3 – 4 minutes until tender. Drain and place in a blender or food processor. Add the cream, butter, salt and pepper and blend until thick and creamy. Adjust seasoning and serve immediately—this does not warm up well. Warm 2 tablespoons truffle glaze over a very low heat and drizzle over the carrots. You can buy truffle glaze from speciality food shops or delis—we use Chef’s Choice Crema al Tartufo, which is a blend of balsamic vinegar and truffle. What you need: 1 bunch spinach, 1 large sweet potato; 1 tablespoon butter, 1 clove garlic (crushed) and salt and black pepper to taste. What you do: Finely chop the spinach and place in saucepan. Toss in crushed garlic and just cover with water. Bring to boil and cook until spinach is tender, drain and set aside. While the spinach is cooking, peel and chop the sweet potato and boil in lightly salted water for about 10 – 15 minutes until tender. You should aim to have the spinach and sweet potato ready at the same time. Drain the sweet potato and add the butter, salt and pepper, and mash with a potato masher until creamy. 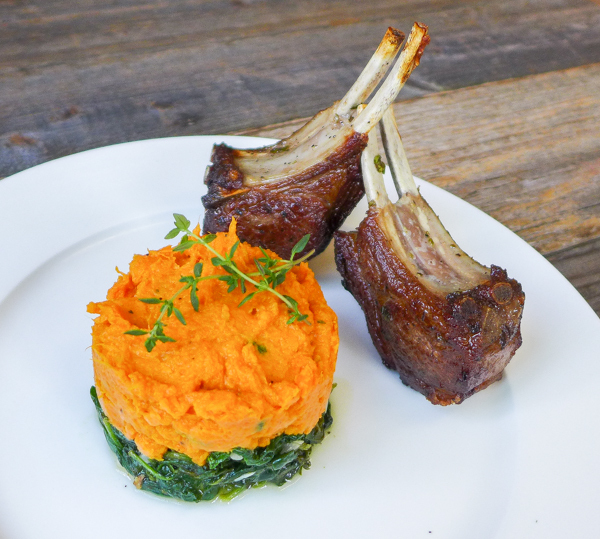 Place a small round of spinach on the plate and top with sweet potato mash. Serve immediately. This is a lightly spiced and crunchy, raw carrot salad. You can make it spicier by adding chilli. What you need: 4 medium carrots; 2 tablespoons extra virgin olive oil, juice of 1 lime, 2 cloves garlic, 1 teaspoon ground cumin, 1 teaspoon sweet paprika, pinch salt, and 1 heaped teaspoon finely chopped green chillies (optional). What you do: Peel and grate, or julienne, the carrots. In a large bowl mix all the other ingredients, and stir in the carrots. Cover and place in the fridge for about two hours so the flavours fuse together. Serve at room temperature. This is a simple degustation combination of mushrooms, olives, and cherry tomatoes. We used pitted black olives, and large whole flat mushrooms. What you need: 1 whole flat mushroom per person; 2 – 3 olives per person; 1 – 2 cherry tomatoes per person; 2 tablespoons extra virgin oil; a few kaffir lime leaves, and pesto sauce. What you do: Pre-heat oven to 1800 celsius. Spray (or brush) a baking tray with oil, and place the mushrooms on the tray in a single layer and roast for approximately 15 minutes until slightly soft. Make a small cut in the tomatoes so they don’t burst when cooking and add the olives and tomatoes to the tray, drizzle over the oil, and roast for a further 15 minutes. To plate: Place the mushroom on the plate and top with the olives and tomato. 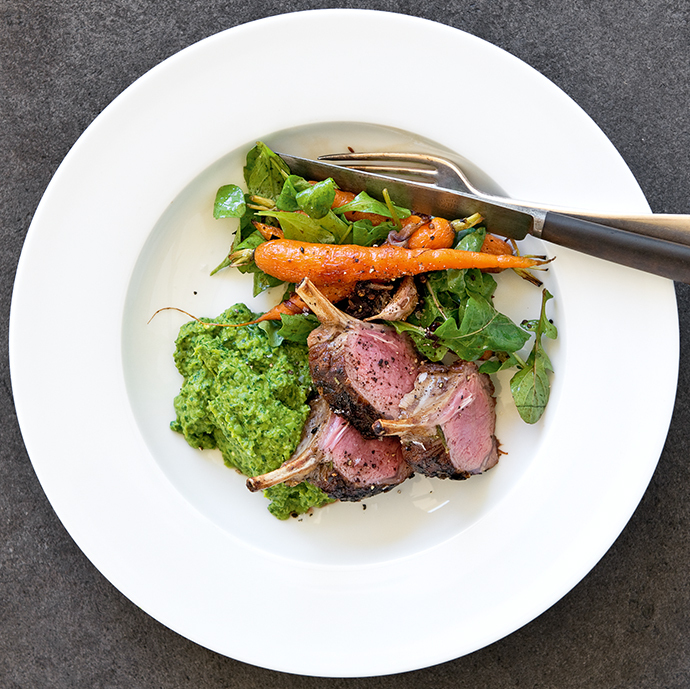 Decorate with kaffir lime leaves and drizzle with the pesto sauce and juices from the roast lamb. 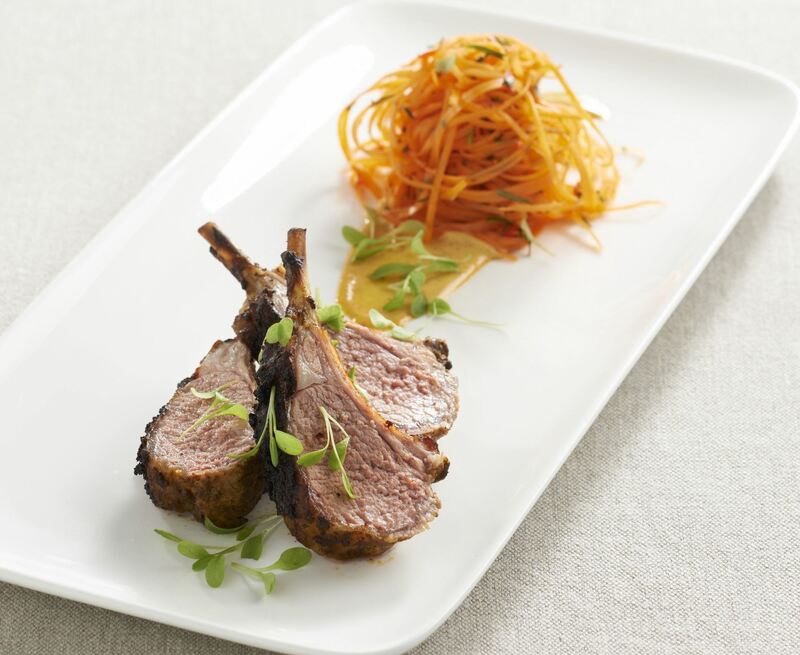 Share your favourite lamb recipe with LFW! This entry was posted in LFW Food&Wine and tagged Caramelised Onions, Creamy peas, Moroccan carrot salad, roast lamb and veggies, roast rack of lamb, Simple lamb roast on July 11, 2015 by gracienumber1.